PMC has helped millions of American shooters keep the cost of range practice down with its affordable yet good quality target ammo. Cost is a particularly significant concern for .45 ACP shooters, making this 1,000 round case from PMC a great value for training with a 1911, Glock 21, Springfield XD or other .45 Auto pistol. 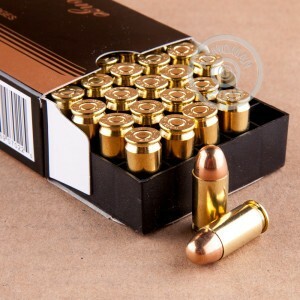 These rounds use a standard pressure load and 230 grain full metal jacket bullet as well as non-corrosive Boxer primers and reloadable brass casings. 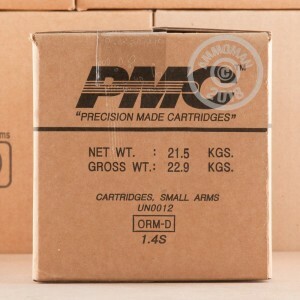 PMC (Precision Made Cartridges) brand ammo is produced in South Korea by a top defense contractor for the Republic of Korea Armed Forces. The company's manufacturing process uses rigorous quality control measures to ensure consistency between batches and reliable performance. AmmoMan.com is committed to transparency in pricing and offers free shipping for all orders over $99. If you buy more than $99 worth of ammo from us, you pay only the list price, with no added S&H fees whatsoever. Good Ammo. No issues. Will purchase again. Will definitely buy again from Ammoman. good ammo, no problems. good to use and stash. Will buy again as needed. PMC is good ammo. Very pleased with this ammo. Was using Federal before but came across PMC and picked up a 1000 rounds and have gone thru several hundred rounds with no issues whatsoever in my hk usp compact. So pleased with this ammo that i picked up a 1000 rounds for my ddm4 v11. Great price, great service! Definitely will be ordering more! 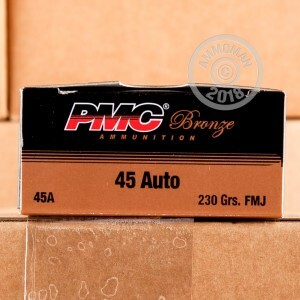 Great ammo, great price, super fast shipping… no need to go anywhere else! If you are going to burn through a bunch of training ammo this stuff is fairly inexpensive and has great brass for reloading. Very few issues with cycling and they are usually the magazines fault. Love Ammoman! Eric and the Boys at Ammoman always treat me squarely! Prices very competitive and delivery always prompt! I also appreciate the new Bonus Purchasiing Program...Thanks Ammoman! Functions 100%. Relatively clean, but as clean as Federal. Uses large pistol primers, excellent brass for reloading.